Gemini Translation and Training Services is a company that provides translation service. Our office is located in Kuala Lumpur (KL), Malaysia. Gemini Translation and Training Services added 3 photos to the album - Simultaneous Interpretation. 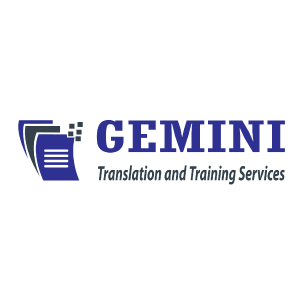 Gemini Translation and Training Services updated in Career. Gemini Translation and Training Services updated in About Us. Gemini Translation and Training Services added 6 photos to the album - Team building . Gemini Translation and Training Services added 3 photos to the album - TMEF SME Tech Summit. Gemini Translation and Training Services added 6 photos to the album - Certified Translator & Court Interpreter Course. Gemini Translation and Training Services added new photo to the album - Simultaneous Interpretation. Gemini Translation and Training Services added 5 photos to the album - Consecutive Interpretation. Gemini Translation and Training Services added 8 photos to the album - Simultaneous Interpretation. Gemini Translation and Training Services added 3 photos to the album - Attending seminar ��From Amateur to Professional - The Translator��s Guide�� in UPM. Gemini Translation and Training Services added 11 photos to the album - Certified Translator & Court Interpreter Course. Gemini Translation and Training Services added 5 photos to the album - BNI Group Sharing. Gemini Translation and Training Services added 7 photos to the album - Training. Address: Lot 3.42, 3rd Floor, Jalan Kepong, 52100 Kuala Lumpur, Malaysia. Address: 8, Jalan 6/2B, Taman Desa Bakti, Selayang, 68100 Batu Caves, Kuala Lumpur, Malaysia.